Maintaining fruit trees and thinning woods is a much safer and more convenient job with a STIHL pole pruner, for the "chainsaw on a pole" makes it possible to cut branches without leaving the safety of the ground. 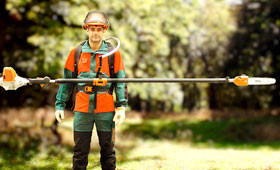 The models with telescoping shaft STIHL HT 101 and STIHL HT 131 can cut branches up to 5 metres from the ground. The electric pole pruner HTE 60 is ideal for jobs near residential buildings and in areas where noise is undesirable. With power that’s easy to handle.